What do Trumpeter Swan feathers look like? Check out this site. You can also type in the names of other birds to see what their feathers look like. This website promotes feather identificaton, research, and appreciation by providing high-resolution scans of the flight feathers of North American birds. Use "Search scans" to see the feathers of up to 396 bird species. For each species, the Feather Atlas typically illustrates all the primaries (outer wing feathers; usually 10), 10-12 secondaries (inner wing feathers), and six rectrices (tail feathers) from an individual bird. 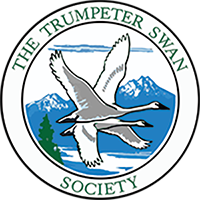 This paper, while written in scientific language, has excellent background information about Trumpeter Swans in its first 4 pages. This list of historic references and quotes about swans was compiled by Dr. Donald A. Hammer. It includes references by Lewis and Clark, John James Audubon, and a host of explorers across North America. Check out the Journal Entries for Patrick Gass for October 30, 1805, November 4, 5, and 8, 1805. October 30, 1805 near tidewater on the Columbia River, "On our way down we saw a great many swans, geese and ducks…." November 4, 1805 same place: "We also passed a number of Indian lodges; and saw a great many swans, geese, ducks, cranes and gulls." November 5, 1805 same place: "At noon we stopped about an hour at an island, and some of the men went out and killed nine brants and a swan." November 8, 1805 same place: "In it there are a great many swans, geese, ducks and other water fowls." All students in kindergarten through grade twelve are encouraged to participate in the Junior Duck Stamp Conservation and Design Program annual art and conservation message contest as part of the Junior Duck Stamp Program curriculum. The Junior Duck Stamp Art Contest is the culmination of the Junior Duck Stamp educational program. After studying waterfowl anatomy and habitat, students may express their newfound knowledge by drawing, painting or sketching a picture of an eligible North American waterfowl species. Because students express themselves best in different formats, the conservation message contest gives them an opportunity to use the written word to express their knowledge. Students from across the United States submit their artwork to their state, territory or district competition.